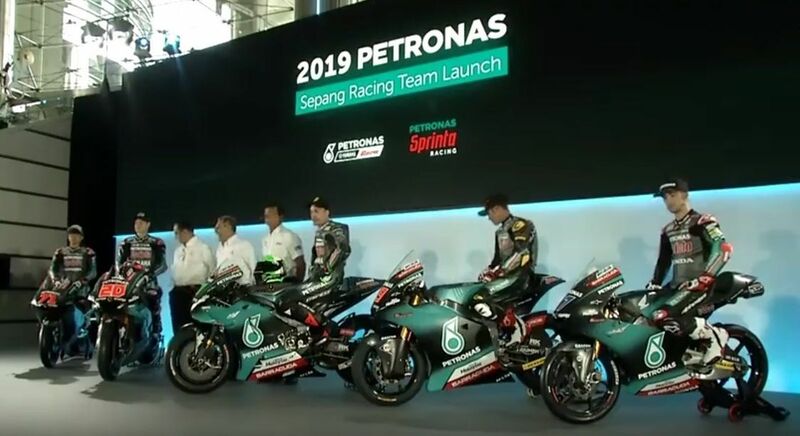 The new Petronas Yamaha SRT outfit launched its 2019 MotoGP bike in a special event in Malaysia in the presence of its riders and team management. The Sepang International Circuit-backed Yamaha SRT will make its MotoGP debut in 2019 after years of racing in the Moto2 and Moto3 categories. It takes the place of Angel Nieto on the premier class grid as the new Yamaha satellite outfit. The 2019 MotoGP bike was revealed at a launch event in Malaysia with riders Franco Morbidelli and Fabio Quartararo in attendance along with team manager Wilco Zeelenberg also present along with their Moto2 and Moto3 riders. The new Yamaha M1 livery has the usual Petronas colours seen on the Mercedes Formula 1 car with the florescent green in abundance along with the colour black and a bit of grey on top and at the sides. The factory Yamaha outfit is yet to officially unveil its 2019 bike which will be ridden by Valentino Rossi and Maverick Viñales. But the colours will be different to the Yamaha SRT bikes with Monster Energy backing the factory team and Petronas going with the junior. “I feel we are taking part in a great thing,” said Morbidelli. “Petronas and SIC are doing a great thing too, so I’m very pleased. I hope we can get good results and make Petronas people happy. We started well, and we have been working well from the beginning. The bikes for the Moto2 and Moto3 championships’ was also unveiled with the former to be ridden by Khairul Idham Pawi and latter by John McPhee & Ayumu Sasaki under the SIC Racing Team branding. An unveiling for the history 📖.